"This meringue is made with a sugar syrup and is stabilized by cornstarch. More durable than most meringues. Can be used to top 1 pie, or can be piped onto a baking sheet to make 'nests.'" In a small saucepan combine 2 tablespoons sugar and cornstarch. Mix well then whisk in water. Cook over medium heat, stirring constantly, until mixture is thick and clear. Remove from heat and allow to cool. In a large mixing bowl combine egg whites, salt, and vanilla extract. Beat until soft mounds form. Gradually add 5 tablespoons sugar, beating well after each addition. Continue to beat egg white mixture while slowly pouring in cornstarch syrup. Beat until stiff peaks form. 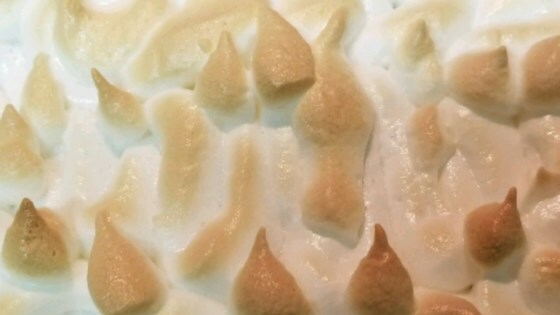 Spread meringue on top of pie, or pipe desired shapes onto parchment-lined baking sheet using a large pastry tip. Bake in preheated oven for 12 minutes or until golden brown. A delectable balance of lemon meringue and cheesecake! OMFG! they taste like burnt fried eggs coated with corn syrup, and they look like dried up grandma fingers! I threw up...LEGIT!